Parker Hannifin has developed a new, energy-efficient generation of hydraulic drives. With its Drive Controlled Pump, the company offers hydraulic system solutions that are tailored to a given machine cycle. The supplier uses its DriveCreator software tool to ensure that the systems are optimally designed, allowing a database-supported selection of specific components from a wide range of AC drive controllers, electric motors, and pumps as well as enabling their combination to form complete solutions tailored to customers' specific needs. With the Drive Controlled Pump, the supplier is looking at the drive itself and, for the first time, connecting the electromechanical drive with the hydraulics to create a complete system solution based on electrohydraulics. 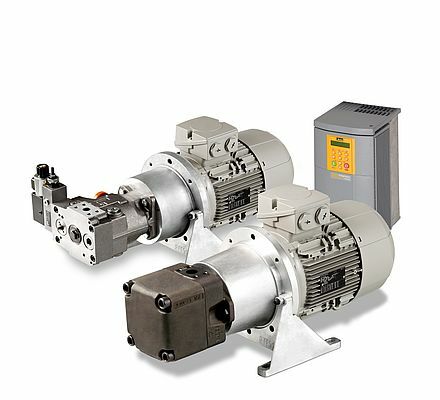 The speed control, regulated by an AC drive controller, allows new possibilities to provide both volume flow and pressure precisely - for example with vane pumps with constant displacement volume. This reduces losses in converting electrical energy to hydraulic drive energy, and increases the energy efficiency of the entire drive.